FGP’s Franchise Operating System (FOS) offers private, instant and cost effective communication for franchisors, franchisees and their employees. Our FOS reduces the constant need for faxes, scans, emails, attachments and enables franchisees and your training and support team to connect, improve 2-way communication and remain “healthy and connected” from the start. Franchise Growth Partners has made a total commitment to the success of our strategic partners. 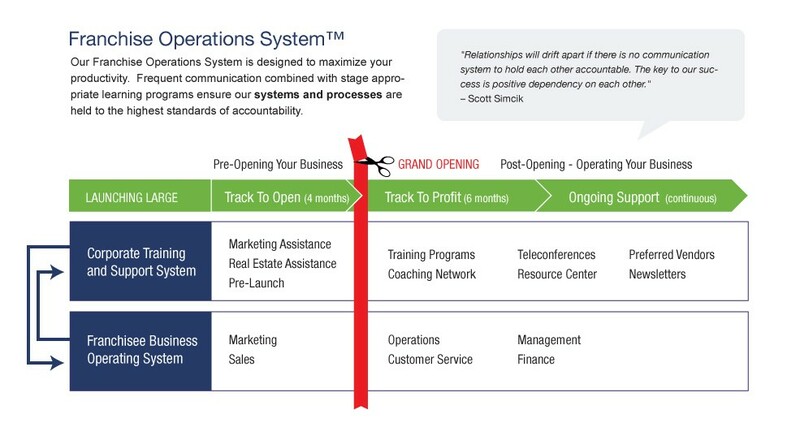 Our Franchise Operating System provides a 2-way communication system & responsible operational processes to remain 100% financially healthy and emotionally connected throughout each stage of our partnership. As CEO of a franchise system, you will now be able to offer the franchise industry’s only state of the art proprietary web-based support system that is configurable to your franchise company. We offer this FOS only to our exclusive franchisor client list. Its value is immeasurable and our biggest value proposition. You will essentially remove any and all reactive communication out of your franchisor and franchisee activity and prevent problems before they occur. FGP’s FOS will literally take the headache out of franchising for CEOs. You will enjoy at the click of a button a Franchisee Dashboard that tracks at a glance every single activity that is occurring from the date the franchisee agreement is signed. Our green light, red light system reports how healthy and connected your franchisee is to your company during each respective stage of their development week by week. Lack of Communication DESTROYS all relationships (Parent/Child, Husband/Wife, Friends, Employer/Employee, Business Partners and Franchisor/Franchisee). Lack of Communication exists because there is NO “System or Process” In Place to hold each other accountable, which causes a relationship to drift apart. The Key to our Success is Positive Dependency on each other. Beginning in Stage 2, a monthly session ensures that both parties do not drift and remain positive and dependent on each other. Up to two hours per week for the first 24 weeks is a total of 48 hours to secure a healthy and connected relationship for the successful launch of a business. What Role Does 2-Way Communication Play As Our Key To Success? Remain Healthy and Connected … Is our #1 priority. This control tower/astronaut high frequency daily and weekly communication ensures a “Large Launch” within the first year of business and the subsequent years. A high level of dependency on each other will secure our partnership goals. Our ‘Green and Red Light’ monitoring system allows this highest level of 2-way communication. Dashboard Viewer … Our Franchisee Dashboard is a communication-active approach to train our franchisees and their employees. It provides an early indication of weekly training attendance and operational performance recap before it is too late. From this dashboard we can see an overview of all activities that need to be monitored on a daily and weekly basis to Launch Large. This allows each franchisee an equal opportunity to follow a standardized support system regardless of the growth of expansion for our brand. Operational Heart … Our system is used for logging and tracking all support calls and has the following features: Call time recorded, attendance and auditing trail, who is responsible for scheduling the call, unlimited notes for detailing issues and solutions, daily, weekly and monthly revenue reporting, actual client service retention and saving old calls. Appropriate entries can be electronically signed off by either party. Operational Responsiveness … Time is a luxury most businesses don’t have! Decision making must respond immediately to events, changing conditions and customer activities with no extra steps, wasted energy or mistakes. This can only be achieved by a communication driven mindset during the life of our partnership. Seeing and Preventing … Every obstacle can only prevented or overcome through consistent weekly meetings with detailed, accurate and timely reporting. The absence of this commitment causes rapid decline in marketing, sales, services and employee turnover. Quick access to information will identify the immediate Training and Support needs of our franchisees and their employees BEFORE problems occur. We can monitor business tracking compliance, recording information easier and faster. We want to eliminate any and all hindsight from our business. Information Sharing … Enables us to communicate and track through EACH important stage of your unique business (i.e. ; Real Estate, Track-to-Open, Pre-Launch, Marketing Solutions, Track-to-Profit, Customer Service, and Regional Conferences) easily and efficiently with one centralized ‘real-time’ Franchise Operating System. This fast transparency into each stage of data helps communicate business objectives, reach higher standards of operation and prevent revenue leakage.